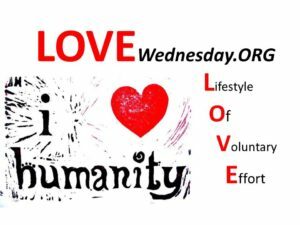 L.O.V.E in the Republic Of Conscience means committing Random Acts Of Sustainability in your daily life and a FOCUS every “CHANGE WEDNESDAY” on living a Lifestyle Of Health Happiness And Sustainability (LOHHAS). 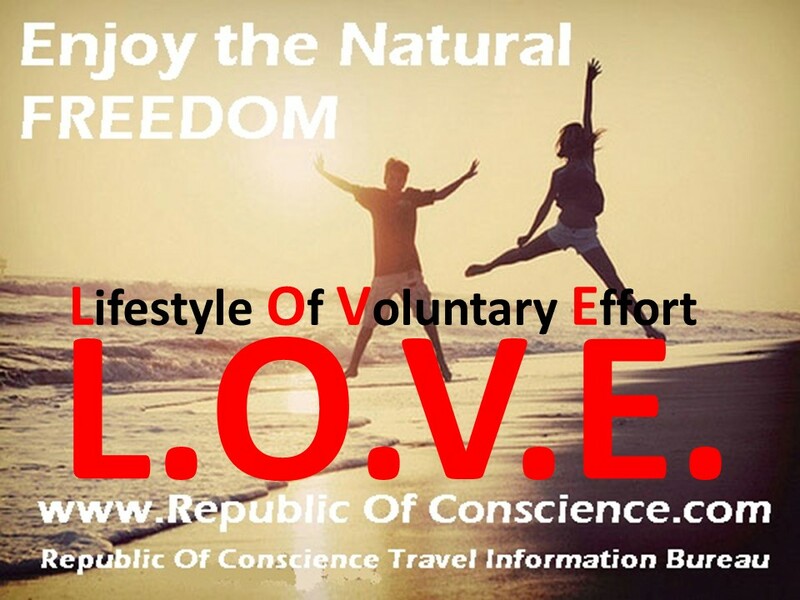 The ENERGY of the Republic Of Conscience vibrates at The Frequency of LOVE. L.O.V.E. means “Lifestyle Of Voluntary Effort” – the easiest way to achieve LOHHAS – a Lifestyle Of Health, Happiness And Sustainability. 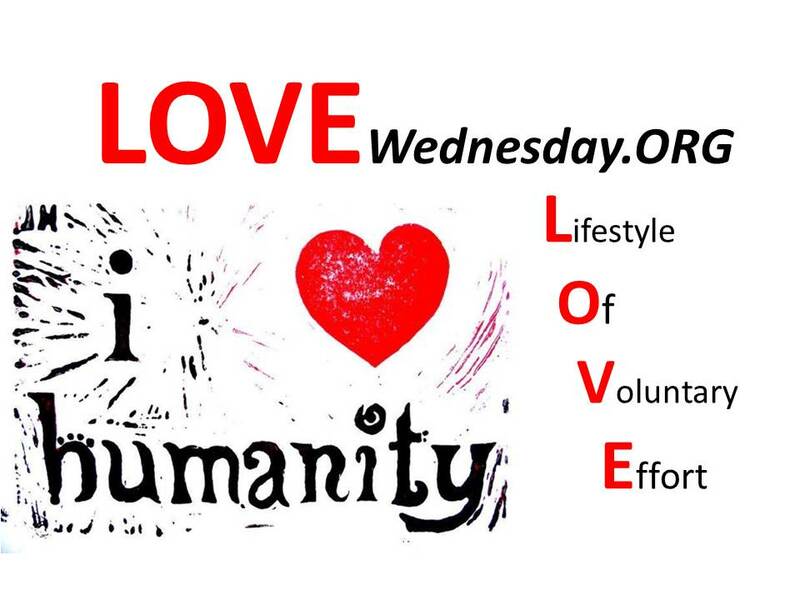 Every Wednesday, Citizens of the Republic Of Conscience make a special effort to SMILE ~ CHANGE ~ UNPLUG_\!/ …to practice channeling their L.O.V.E. ENERGY into POSITIVE ACTIONS that improve humanity. It is increasingly difficult to find love in the world. 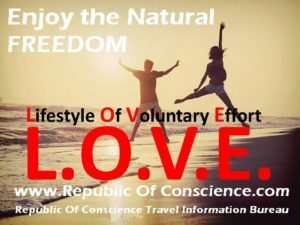 So to help Citizens of the Republic Of Conscience, the “Intelligent Agent” RoBOTs of LOVE – BOTofLOVE – “WOW” “TIP” and “PIN” are here to help you. SEE “SustainaDATE”. With so many lonely people in the world and so many matchmaking services going after our money, do we need another? YES_\!/ Why? because most “matchmaking” services either match you with an algorithm of yourself or simply compete for the highest yield investment i.e. the “richest” mate. In the Republic Of Conscience, we think this is altogether the wrong way to go about matchmaking. We’ve started something called “SUSTAINABLEDATE(S)” or SustainaDATE for short. 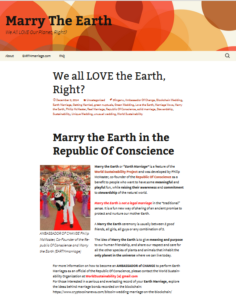 The idea is, the most sustainable relationship is the relationship that has common interests in meaningful issues and works toward individual and joint sustainability – not only in the relationship between two people, but the couples’ relationship with family, friends and the community and Earth at large. People who consider sustainability important are most often “responsible people” – caring about something and someone besides yourself shows maturity and understanding of your responsibility to live a life in balance with everything around you. 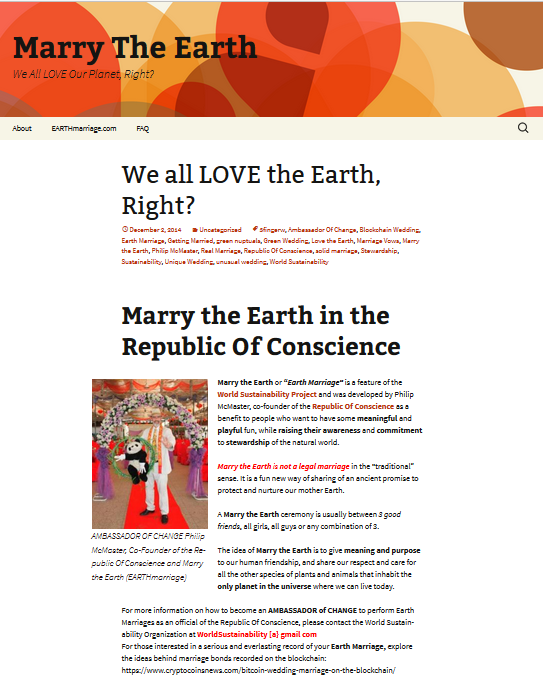 There are no priests, ministers or government officers officiating at MARRYtheEARTH Ceremonies. 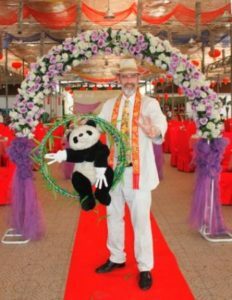 They are welcome to attend, but these ceremonies are not often public spectacles and they are usually private and always unofficial, performed by an AMBASSADOR of CHANGE from the Republic Of Conscience .